Bubble gum Easter Egg in a plastic egg carton. These are a perfect candy for filling your Easter baskets with. 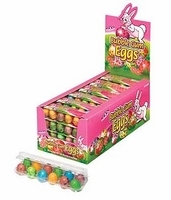 Each Egg carton has 12 fruit flavored egg shaped gumballs in a variety of colors. Please note we have run out of the 24 count boxes so we will be substituting with 6 packs of 4 count bubble gum egg cartons. We have all your favorite Easter Basket Candy. Pez, Peeps, Candy Bracelets with a Bunny Head Charm, Jolly Rancher Jelly Beans, Jelly Belly Beans, Bunny Suckers as well as a large selection of Easter Chocolates.